PARK(ing) Day Returns This Friday! Across the world this Friday, there will be several hundred fewer car parking spaces and just a little more park space. Concerned people from around the globe will be converting car spaces into mini-parks—many with sod, benches, games, etc. Here in Sacramento, we will be creating several spaces across the grid. I’ve created a webpage that has all the information you need to know about our local efforts. Visit it here. On the page, you will find park locations, contact information, information for Facebook, photos from last year’s event, event flyers, and more. The park I’m involved in organizing will be located at J & 20th Streets in Midtown. The park will be named Presley Park in memory of Jason Presley who was incredibly instrumental in bringing together last year’s amazing park. 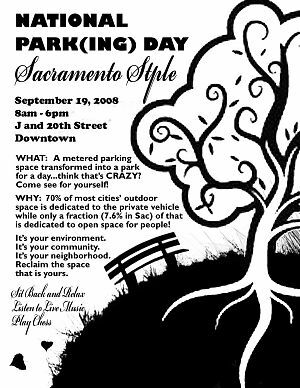 For those of you in other cities, I encourage you to check the PARKing Day Headquarters website to see if there’s a park in your community. I had so much fun last year that I’ve decided to spend the whole day in the park this year. It’s one of my favorite days of the year! That game of chess pictured above was not staged, by the way. Two strangers just sat down and decided to play! Next post: Happy PARK(ing) Day!